I bit on the Fathead Black Friday deal this year to order a team logo for my game room. The package arrived via UPS ground shipping a few days later. 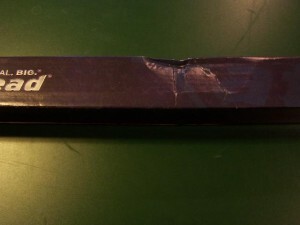 Unfortunately, the box was damaged during shipping and the damage causing damage to the logo as well. The logo was creased in multiple locations on the adhesive background but I thought it might smooth once I applied it to the wall. Before I removed the logo from the adhesive I photographed the creases so that I could prove the item had been damaged during shipping and not during installation. Unfortunately, when I installed the logo I was not able to smooth the creases. So I called the customer service line at Fathead and explained what had happened. I was sure this was probably a common problem for them and there might be some ‘tricks’ they could help me with to smooth the creases. I informed the agent that I had photographs of the damaged shipping box and the logo. The agent politely apologized for the incident and told me that there really wasn’t anything more to do. He immediately offered to create a return for this item and to ship me a new one at no additional charge. He even offered to upgrade the shipping to an expedited method at no additional charge. They gave me an option to send the damaged logo back to them or to simply email the photographs as proof of the damage. I certainly appreciated that they emailed a UPS labels with the RMA# in an email, but sending them an email with the photographs attached was less hassle and something I completed quickly. This shows a couple areas of creasing on the logo. I photographed other areas with damage as well. Their return process credits the amount of the original purchase back to original card once they receive proof of the damaged item. The replacement item is then charged to the card as a new transaction for the same amount of the original purchase. 1. The customer service agent immediately acknowledged the situation and offered to make me whole. I’d like to think I aided with this because I calmly explained my situation and really hoped he had a way to fix it without having to do a return. To his credit, he recognized I wasn’t trying to cheat the system and didn’t hassle me in any way. 2. Issuing a return based on creased product shows me that Fathead realizes the value of their product is in the attachment the customer has to the affinity group represented with their merchandise. These products are meant to be displayed to friends, guests, and family. A damaged product is almost like a chink in the pride and emotional attachment the customer has to the product. 3. At the end of the day, the damage on my product was not directly the fault of Fathead. I can see where Fathead has attempted to protect their merchandise with a double layer of packaging (cylinder tube inside shipping box), but whatever happened in that UPS truck overcame the packaging. As a business thinker, its tough to rationalize sending a new product when the damage occurred after the product left the warehouse. Hopefully this doesn’t happen too often or they have some type of insurance agreement with their shipping partners. BTW – I didn’t take the offer for free expedited shipping. I told the guy that I didn’t have to have it any quicker than what ground delivery would provide. Fathead helped me in the transaction so I felt a little better that maybe I saved them a buck or two as well.